REVIEW - Splatoon - Use a Potion! You’ve gone out to your local video game store and bought Splatoon. You’ve brought it home, turned on your WiiU and loaded Splatoon up. The game boots up and you play. Now stop playing. Go to the options menu and turn off motion controls. Phew, panic over – you’ve just made Splatoon a much better game. I know that isn’t a conventional way to start a review but I feel that it is vital you know. For a game that requires precise shooting it seems mindless that Nintendo had the awkward motion controls as the default option. It’s easily changed though, so it’s nothing that holds the game back. 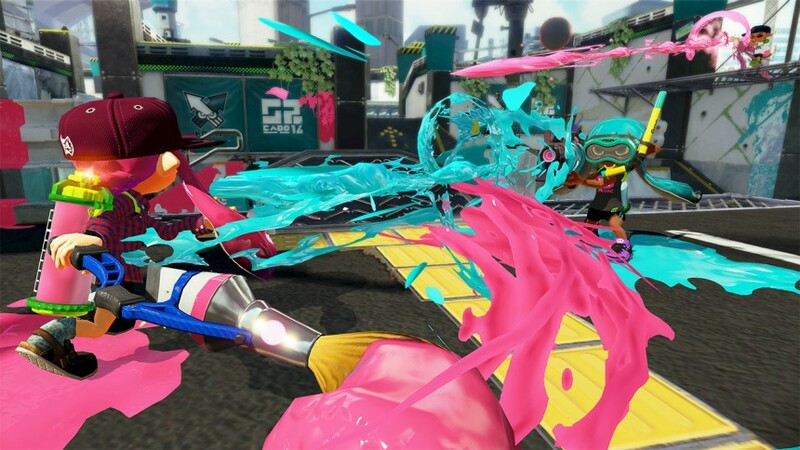 Splatoon is Nintendo’s take on the third person multiplayer focused shooter. Of course, with this being Nintendo everything has a more charming feel to it. There are no boring space marines in this – you play as colourful Inklings who can switch between humanoid and squid form. Don’t expect any AK47s either – Splatoon’s arsenal consists of weapons that plaster the area in ink, be it the splattershot or maybe the splat roller. And don’t expect a deathmatch either – matches in Splatoon are territory wars, you teaming up with three other players working against another team of four to see who can cover the map with the most ink within the time limit. It’s all very charming and in typical Nintendo fashion very fun. 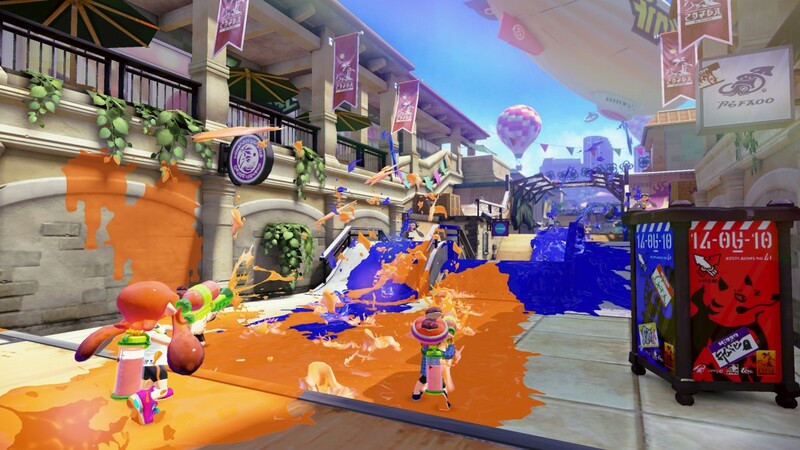 Despite this, Splatoon has quite the flaw – a lack of content. Online play is initiated by entering a lobby in-game. Here the game will match you up with 7 other players – the game won’t start without a full lobby of 8 players. Matchmaking works really well; there was only one occasion where the lobby seemed to freeze out, making me wait the full 3 minutes before letting me leave. Fortunately whilst waiting for a match to begin you can play a little minigame called Squid Jump. It’s a retro themed take on the Doodle Jump formula but it’s simple gameplay is pleasant to play whilst waiting for the match. Admittedly it may have made more sense for the game to offer you the ability to customise your character or change your weapon – that won’t stop you enjoying Squid Jump though. Once a match starts it’s time to get down to business – painting the map in your team’s ink colour. The way to win a match in Splatoon isn’t about who gets the most kills but which teams colour covers the most of the map. It.s very fast paced and looks great running at a fairly constant 60fps. It’s an enjoyable change to the typical third person shooter formula. Sure, you can still defeat members of the other team but it won’t win you the match. It also opens up some satisfying scenarios – nothing beats following behind an Inkling with a roller, painting over all their hard work without them noticing. Its silly fun, but with a big emphasis on the fun. Having the most ink on the map offers you a bigger advantage too – when in squid form whilst navigating through your own ink you get a massive speed boost. However, on ground with your opponents ink you’ll find yourself completely restricted, becoming easy prey for your enemies. It truly is a turf war in Splatoon. Taking squid form also allows you to hide from enemies in the ink which can give you the upper hand if you wanted to catch the enemy off guard, leaping from within the ink. You’re not quite Solid Snake but its effective for taking out that pesky Inkling who’s smothering the area with his ink. At the end of a battle bizarrely cat judges who has won the match – just another wacky character in the weird but world of Splatoon. A charming little detail is that the game will refer to your team as the good guys and the opposing team as the bad guys; it’s these minor things that really add character to Splatoon. There’s a variety of weapons to use in battle from the long range splat charger, the free shooting splattershot or the melee based splat roller. Each weapon has it’s own advantages. You could use the splat roller and cover a lot of ground with ink quickly, however it’s no good against enemies attacking you from range. Take on the splattershot and you won’t cover as much ground with ink but you’ll be able to defend yourself better against enemies attacking from range. You also have sub weapons like the burst bomb that lets off an ink explosion or an ink mine which you can use as a trap for your opponent. If you’re lucky you’ll have a team that has a balance of close and long range weapons, however there’s no way to tell what weapons your team mates have until the match begins. Also, the game has no voice chat features meaning it would have been difficult to really work tactics with your team mates anyway. Nintendo cited the reason for the omission of voice chat as them wanting a positive online community with no abuse between players. Everything about Splatoon is aimed to be family friendly and by omitting voice chat their making sure online is family friendly too. Although I understand Nintendo’s reasoning it’s still frustrating – especially when you consider Splatoon’s mutiplayer focus. At launch there are five maps to play on with just the ‘turf wars’ game mode to play. The game has an odd system where only two maps are available at a time and are changed every four hours. This can cause the gameplay to feel a bit stagnant, sometimes finding yourself playing the same map repeatedly (I played one five times in a row at one point). It’s a poor decision on Nintendo’s behalf with some gamers only able to play for maybe an hour a day it would’ve been nice to try out all the maps at any given time. Even so, five maps isn’t really a large amount of maps to play across anyway – a game driven by multiplayer should launch with at least double that number. It’s frustrating that only the ‘turf wars’ game mode is available at launch too – it’s an enjoyable mode to play but other third person shooters come packed with different games modes. Nintendo have promised though that new modes, maps and weapons will be available for the game on a regular basis and for free. There’s a local co-op multiplayer option available too with one player using the gamepad’s display and the other the TV screen. You compete against each other one on one to destroy balloons spread across a map. It’s nothing special and a bit bare bones but there’s no reason you won’t get some enjoyment from it, especially considering the lack of local multiplayer in games these days. 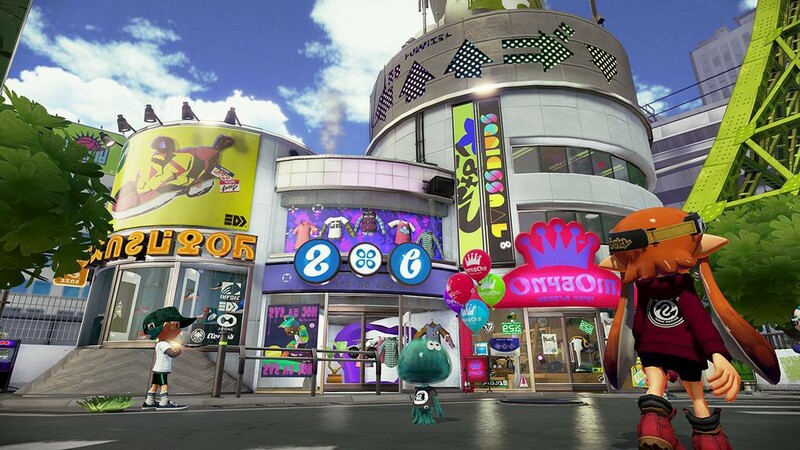 There are plenty of shops in Splatoon to visit to buy gear and weapons to customise your character, although most of them won’t even consider selling to you unless you’ve levelled your character up to level four (which won’t take you long). You can give your Inkling a unique look, spending the cash you accumulate in multiplayer mode. Each piece of clothing comes with different stat boosts for your character that can give you the upper hand in online mode. The more you level up the wider range of weapons and clothing is made available to you so it gives that extra incentive to boost your character up as much as possible. There’s also some weapons that can only be unlocked from beating the various bosses in story mode. It’s surprising that Nintendo really undersold the single player option as I found it really good fun. It has a basic back story of the Inkling’s war with the Octarians, and although not deep in detail carries enough background to keep you entertained and motivated to defeat your Octarian foes. Each story area consists of a few levels (usually six) and then a boss fight. The levels are really a pleasure to play. They introduce a lot of elements you won’t find in the multiplayer mode of Splatoon, such as the sponges that grow as you splat them, invisible platforms that only become clear as you shoot them, platforms powered by fans and much more. They had a whole extra level of diversity to the gameplay of Splatoon and it’s a shame that fans who decide to skip the single player experience may miss out on them. Each level has a theme to it, be it just making your way across the map traversing all the obstacles, sneaking through a level in your ink avoiding sniper fire, carefully dodging twists of ink shot down at you from above or simply defeating enemies on the way to a goal. There’s a good variety of enemies that require different methods to take down, them all expertly crafted and all wacky in design. There’s plenty for you to do and every level is clearly carefully crafted and a joy to play; there isn’t a single weak level in the experience and it’s a real credit to Nintendo’s passion to create fun driven games. Each area ends with a boss that has a weakness you can exploit. They are entertaining to come up against and each has it’s own very creative Nintendo look, but they never really pose much of a challenge. Once you’ve worked out the weakness it’s simply a case of repeating the method, although the boss does get a little stronger as the battle goes on. It’s made all the more easier given that after every hit you make on the boss the game activates a checkpoint. The single player campaign is moderately short, probably lasting you around about four hours. It’s also pretty easy; Checkpoints come along regularly and the games enemies and obstacles never really give you a great challenge. There is a collectible scroll to be found in every level and if you decide to collect all of them it will add a couple more hours to the game; they are never that hard to find though. Graphically Splatoon is a stunning game. Everything is brightly coloured and very vibrant; all characters have their own zany look and fit into the madcap world perfect. Everything is smoothly animated and Nintendo has gone all out to make sure every detail is covered; even transforming from humanoid form to squid looks impressive. Environments are full of character and are kept bustling with enemies or NPCs – the main hub Inkopolis is full of NPCs and the city’s building tower over you full of grandeur. There backdrops in levels are full of life too, be it simple city surroundings or a colourful fairground – everything looks great. Most importantly though the ink looks really impressive, the colours looking great smothered across the environment. Nintendo have really mastered the cartoon look – the graphics on Splatoon wouldn’t look out of place on the Playstaion 4 or Xbox One. Splatoon is a great release by Nintendo and another example of a fantastic experience only available on the Wii U. Online multiplayer is fun and the graphics are great. It also hosts one of the most enjoyable single player experiences I’ve played this year. However, content is very minimal. Multiplayer could do with more modes, more maps and even single player could have benefited from a few more levels, Nintendo have promised to keep providing free updates though, and if they stick to that promise and the content keep’s growing then Nintendo will have another great franchise to add to their already wealthy catalogue.